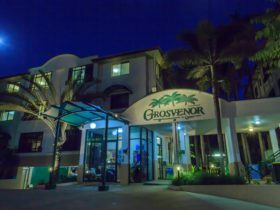 Situated in lush Tropical North Queensland and set overlooking Trinity Inlet and Marlin Marina, Hilton Cairns is the ideal base from which to explore the region’s many attractions. 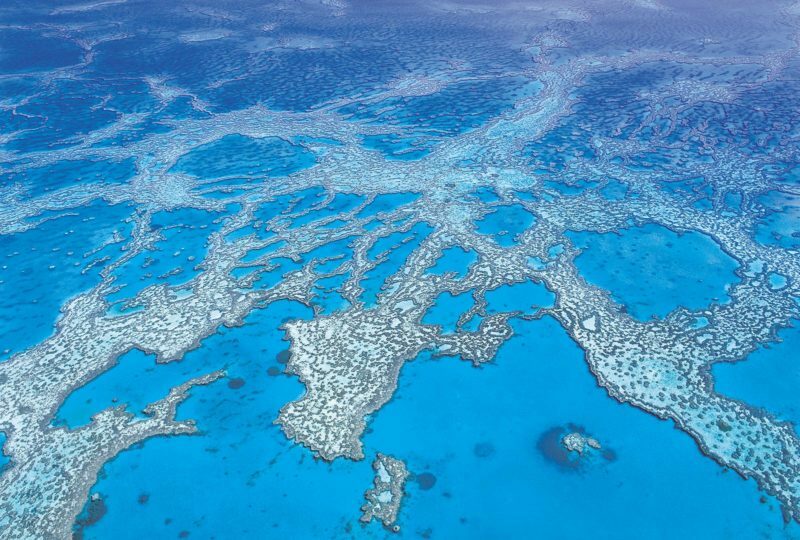 Hilton Cairns continues to demonstrate a commitment to industry leadership and innovation. 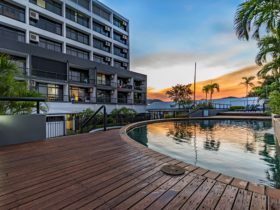 Boasting absolute water frontage, Hilton Cairns is a 10 minute drive from the airport, 100 metres from the Great Barrier Reef departures terminal and within easy walking distance of the Cairns Convention Centre, Cairns Esplanade lagoon and the city’s shopping, tourism and nightlife hubs. 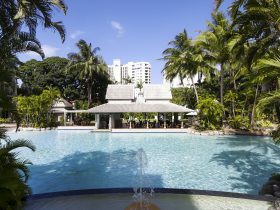 For your enjoyment, Hilton Cairns features a lagoon-style pool and a well-equipped health club and spa. Enjoy al fresco dining at the award-winning Mondo on the Waterfront, and enjoy traditional Italian cuisine at Simply Italian. For the business visitor, the hotel also features a stylish and practical events floor and an Executive Lounge showcasing breathtaking views of the city, ocean and rainforest-clad mountains. Free Wi-Fi access is also offered throughout the lobby and 6 Degrees Bar and Lounge. Business meets ultimate leisure in this modern 30 metre, 323 square foot top floor room with high speed wireless internet, a work desk and ergonomic chair and a private balcony overlooking either the Esplanade or Trinity Inlet. Enjoy exclusive Executive Lounge access with complimentary buffet breakfast, evening drinks and canapés and up to one hour’s private use of the Executive Boardroom. Relax after a busy day with a leather relaxation chair and a state-of-the-art 37 inch LCD high definition television. Features a king bed. Third person accommodated in a rollaway bed. Tropical ambience meets sophisticated luxury in the recently refreshed Double Hilton Guest Rooms. 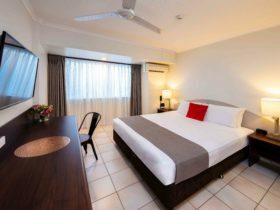 These spacious rooms feature a king bed, a 37 inch LCD High Definition Television, wireless internet and a private balcony overlooking Cairns’ unique tropical cityscape. Maximum occupancy is three people. Third person accommodated in a rollaway bed. Tropical ambience meets sophisticated luxury in the recently refreshed Double Hilton Guest Rooms. 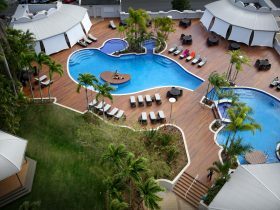 These spacious rooms feature two double beds, a 37 inch LCD High Definition Television, wireless internet and a private balcony overlooking Cairns’ unique tropical cityscape. Maximum occupancy is four people. Enjoy picturesque waterfront views from the comfortable balcony of this luxuriously refreshed 30 metre, 323 square foot room. The spacious area features a 37 inch LCD high definition television, high speed wireless internet and a private balcony overlooking Trinity Inlet. Features a king bed. Third person accommodated in a rollaway bed. Enjoy picturesque waterfront views from the comfortable balcony of this luxuriously refreshed room. The spacious area features two double beds, a 37 inch LCD high definition television, high speed wireless internet and a private balcony overlooking the Trinity Inlet and World Heritage Rainforest. Maximum occupancy is four people. Rejuvenate and unwind as you relax in the spa and enjoy views of either the Esplanade or Trinity Inlet. This 30 metre, 323 square foot boutique Spa Room with fresh, contemporary décor features a state-of-the-art 37 inch LCD High Definition Television, a work station and ergonomic chair, high speed wireless internet and a leather relaxation chair. Rejuvenate and unwind as you relax in the spa and enjoy views of either the Esplanade or Trinity Inlet. Features a king bed. Retreat to a place where absolute luxury overlooks a tropical paradise. The full length of the expansive 120 metre, 1292 square foot Premier Suite is lined with floor to ceiling windows giving you uninterrupted water views across Trinity Inlet to the lush rainforests and Coral Sea beyond. This top floor suite also features separate bedroom and living areas, a kitchenette and two bathrooms, one with a jacuzzi. Surf the net with high-speed internet access or utilise your exclusive Executive Lounge access with complimentary buffet breakfast, evening drinks and canapés. The ultimate indulgence for business and leisure guests alike, spoil yourself with a stylish and contemporary 60 metre, 646 square foot suite with stunning views of either the Esplanade or Trinity Inlet. Rejuvenate and unwind in the spa or take some time out in the spacious lounge area which features a leather relaxation chair and two state-of-the-art LCD high definition televisions. For the business traveller, there’s a work desk and ergonomic chair and high speed wireless internet to maximise your productivity. Enjoy Executive Lounge access with complimentary buffet breakfast, evening drinks and canapés. Features a king bed. Third person accommodated in a rollaway bed.